"People always ask me what kind of books I write and I guess you'd call them love stories, but I also think of them as mysteries. After all, what makes two people fall in love? I've written three novels on the topic and I'm still looking for the answers. 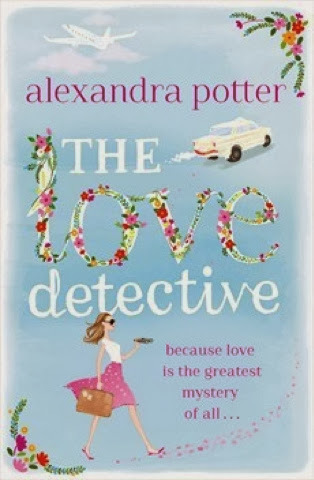 In a way, I'm a bit of a love detective. Because what's a greater mystery than love?" Ruby Miller has lost her faith in love. In an effort to forget her cheating ex and clear her writer's block, she joins her sister for a week's holiday in India... and embarks on an extraordinary adventure. Review: firstly can we all just take a moment to appreciate the gorgeous cover of this book. This is something completely different, a new look for this author and I am completely in love with it! Having read this novel on my kindle, I am actually toying with the idea of buying the paperback just so I can have this cover sitting gloriously on my shelf! Now onto the actual content of the book. I was totally drawn into this book right from the word go. The idea of a writer sitting there in her dressing gown with her cold coffee was the perfect way to hook me into this book and I fell in love with Ruby right from that moment on! Ruby was wonderful as a main character, she was a strong female lead, full of integrity and was determined to get what she wanted, what was best, not matter what. No one could call Ruby a quitter! She was also very suspicious of love and had kind of given up on it, I could definitely identify with this, there are some other really cool characters in this novel. Ruby's sister Amy is your kind of typical spoiled brat but she does have some endearing qualities, jack is an obvious love interest for Ruby right from the word go, but with Ruby's disinterest in love, will she be able to see this herself. Then there is drive Rocky who leads Ruby on hr adventure around India and back into love again. I loved this character, I thought he was so funny and totally tied everything together! The setting of this novel couldn't get any better, starting off set in London and then moving onto a beautifully described colourful setting of India-splendid! I really enjoyed the descriptions of the sounds and smells as well as just the sights that potter put into this, my mouth was watering at the descriptions of some of the tastes too! Potter always has an element of escapism in her novels and a slight nod to mysticism or magic which I really enjoy and so what better setting could she have chosen to incorporate both of these things? Overall this is definitely another hit for this author, if you haven't read any of her other novels, this would be a great place to start and then work your way through her back catalogue! This is a stand alone novel and reading about the heat of India and Ruby's exhausting voyage of self discovery will definitely heat you up in the cold winter months! I loved it!